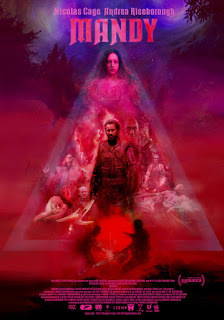 Barbarism reigns supreme in this gory tale about a horrific brutality for which Red (Cage) is determined to avenge wrongs that have destroyed his idyllic existence. He and Mandy (Riseborough) are blissfully happy in their country abode when a pack of crazy cultists named “Black Skulls”, who get their kicks from torture and destruction, descends upon them. Actually, their cult leader Jeremiah (Roache) considers himself a god ever since The Chemist (Brake) mixed up a drug that instantly evokes in the coterie all their burning rage and hatred. They dress in black, ride black motorcycles, and travel at night to wreak their devastation on unsuspecting souls. The film contains many acts of agonizing, bloody violence which, although I’m inclined not to care for such horrors, are, paradoxically, beautifully expressed in Benjamin Loeb’s cinematography, accompanied by Johann Johannsson’s score, and realized in Hubert Pouille’s production design and Ilse Willocx’s sets. Panos Cosmatos, writer/director, has taken a fairly simple story about revenge and displays it against a backdrop of rich colors, design, and special effects. A bit of humor is included during a battle of chain saws (of course, the second one pulled out is much more phallic than the first one) and a scene in which Red literally squeezes a head until the eyes and brains pop out. There is little character or story development; Mandy is primarily a series of vicious acts that are nevertheless artfully presented. Nicholas Cage is at his peak in showing indignant rage about his loss (yelling and sobbing uncontrollably about the senselessness of the crime while downing a full bottle of vodka) and fierce determination to hunt down the perpetrators and exact his own punishment. In contradiction to some of his recent work (e.g., The Humanity Bureau, Inconceivable), this role proves once again his acting talent and skill. Mandy is for diehard horror fans who thrill to see blood-gushing wounds, severed body parts, and dreadful vengeance.